Man, I’m still a bit taken aback by just how many hot dogs are on the Sterns’ “Eat Before it’s Too Late List.” It’s a bit ridiculous. As a couple, they’ve eaten all over this country – admittedly, most of it somewhat lowbrow “roadfood” – but their affinity for hotdogs is insane. 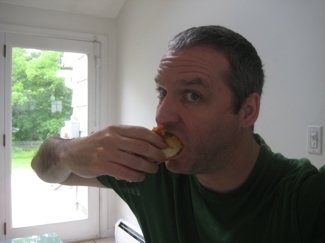 I like hotdogs – though I only eat the turkey variety (rarely, at that) these days – so all these stops on my mission to eat all the Connecticut Roadfood “musts” is okay with me. But I assure you that if I were to do a food list of my own, I don’t think hotdogs would make it on there in any capacity. After all, they’re just hot dogs. However, if I had to include a hotdog, the Doogies dog might be my choice. Of course, I can’t be sure yet as I have so many more to eat around the state, but I’m pretty confident that Doogies is in the top few. Put it this way: I ate their 16 inch dog (with everything except nasty sauerkraut) without trouble. It was that good… Or I am just getting fat. Perhaps a little of both. 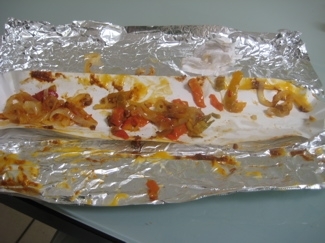 A different search yields a different version of the Doogies site, which boasts Home of the Sixteen Inch Monster Hot Dog™ (Note the other one was ® and this one is ™). Okay, so they cook cheap diner food and they’re not webmasters. I can live with that. And like I said, I had no idea they formerly sold 20 inchers anyway. Ignorance was my bliss, as I thought 16 inches was huge enough for a hotdog. And while I did find the price a bit much (something near 9 bucks I think), it didn’t really phase me too much. After all, Adam Richman from the oddly compelling “Man Vs. Food” on the Travel Channel visited there in October 2009. It appears Adam dealt with the Berlin Turnpike for a mere 16 inches, and so did I. (One of) their websites has a little history page on it. They claim to make awesome fries and Philly cheesesteaks, but I had neither. 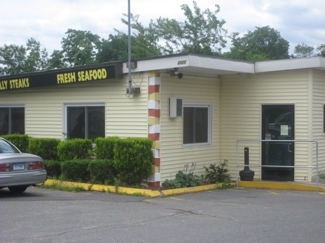 However, the Roadfood list does have another rather random item from Doogies on their list – The Doughboy. While Hoang wouldn’t touch a hotdog with a 20 foot (or 16 foot) pole, she won’t say no to a doughboy, so we ate that for CTMQ purposes here. 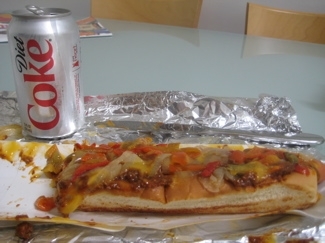 Doogie’s 16-inch hot dog is nothing short of astounding. 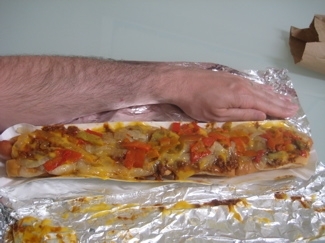 While one of them, in its long, long bun, looks like a hero sandwich fit for four, especially if it is loaded with sauerkraut, chili, onions, bacon, cheese, etc., you will see some big boys walking into Doogie’s at lunch time and ingesting a pair of them (that’s over two feet of frankfurter!) with a large soda and an order of jumbo French fries with cheese sauce on the side. If only for its size, Doogie’s hot dog would be worth noting in the annals of amazing Roadfood; but the fact this extra-long sausage is really delicious. Firm-fleshed and with a chewy skin that gets slightly charred on the grill, it has a vigorously spicy flavor that holds up well not only under any and all extra-cost toppings, but does well when spread with Doogie’s superb homemade hot relish or just ordinary mustard. The brand name of the dog is Grote & Weigal, and for those of meek appetites, it is available in mere ten-inch configuration, too. Beyond hot dogs, Doogie’s sells all sorts of other sandwiches, including a wide variety of terrific Philly cheese steak variations, a real hot lobster roll, and excellent hamburgers. The top of the line hamburger is called the Boomburger. It comes topped with house dressing, lettuce, tomato, bacon, cheese, grilled onions, peppers, mushrooms, and onion rings. If that’s not enough, you can have a double boomburger. The fries menu is itself a delight; fries, cheese fries, chili cheese fries, curly fries, onion rings, and sweet potato fries. 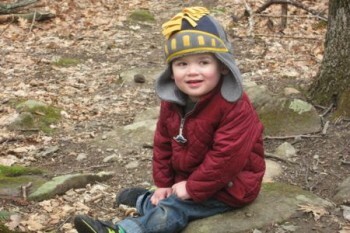 Annnnnd away we go. 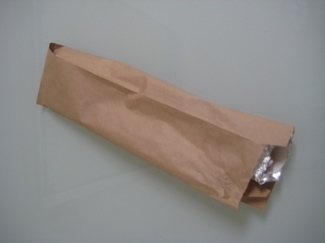 The bag. 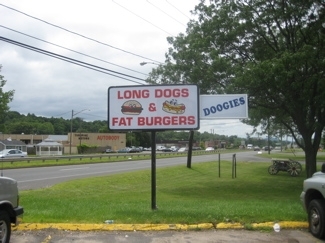 As mentioned, Doogies is on the north end of the Berlin Turnpike near the Wethersfield line. It is tiny and easy to miss. Once inside, the décor aims to transport diners back to the 50’s, which I suppose is cute. Efficiency is the name of the game here, and first time visitors like me stick out like a 20 inch – or 16 inch – sore thumb. 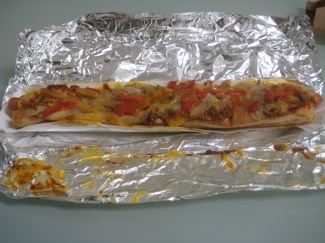 I stammered a bit before ordering the king of the menu: a 16 inch hotdog with the works. Mustard, some hot pepper relish stuff, cheez whiz, onions and bacon. As I waited for my order (everything here is made to order, but doesn’t take too long at all), I noticed a few unique signs on the walls. Aside from all the 1950’s kitsch, there is a prominent sign outlining “Doogies Principles.” This is one of those phony “We’re really angry and tough and take no junk” lists of rules that really serve no purpose, but some people must get a kick out of them. 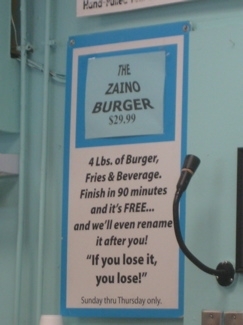 Another sign mentions an eating challenge – the Zaino Burger: a 30 dollar 4 pound burger that you must eat within 90 minutes to get it for free. Why? I don’t know. But who cares, I was here for the hot dog. I got it to-go and raced home to eat it. I have no idea where these guys get their huge buns, but that’s the most interesting facet of the who experience. “Hi, I’m Bob. I work at the giant hot dog bun factory.” I live for that chance meeting. Amazingly, once unwrapped, the bun wasn’t soggy at all from all those toppings. I marveled at the thing for a minute, wondering how I should attack it. I cut it in half and took my first sloppy bite: Mmm, delicious. The toppings only add to the dog, rather than overwhelm. 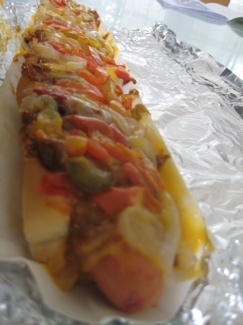 The “snap” of the hot dog provided the needed texture and the flavor was good ‘n hot doggy. The bad glamour shot I’m hiding at the bottom.